Windproof, Thermal pants are a softshell pant that was developed for very cold winter athletics like cycling, running and cross country ski. These Aero Tech Wind blocker tights are designed for extremely cold weather. Like the ones we suffer through here in the NorthEast where the weather gets very cold, wet and windy. The material is very breathable and wicks moisture from sweat away your skin incredibly well. The fabric is a three ply material that protects from the cold, wind and wet weather. It has a DWR (Durable Water Resistant) surface that beads up rain to keep you dry while maintaining a breathable and protective layer for winter biking. Read details below. When working out in snow and ice storms these thermal tights will keep you amazingly dry and warm. The design has a curved, articulated knee that enables the maximum movement without restriction around the knee and leg area. Also see Tall man's Thermal WindStopper Softshell Pants. Knee and back seat area are made of stretch nylon for stretch and freedom of movement during actions like running, biking or cross country skiing. Cold Weather Wind Pant - Features an extended comfort rage from 3 layer laminate making these pants, very warm for outdoor exercise. They break the wind, resist the water and insulate from the cold. Fabric: Three Layers are laminated together for a lightweight and pack-able fabric with excellent wind blocking and thermal properties. The face fabric is a fine tenacity, polyester with a DWR (Durable Water Resistance) surface. This face fabric is treated with DWR in the manufacturing stage and then laminated to a waterproof, breathable membrane and a liner fabric that is a hydrophobic polyester knitted stretch fleece. 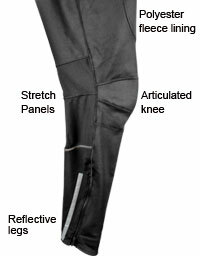 Cycling Tight has a specialized bent articulated knee for ample stretch around the knee so there is no binding or restriction around the knee bend. 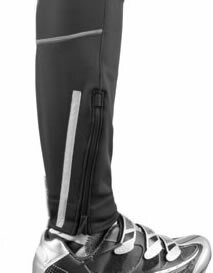 3M Reflective Zipper opening at the ankle area helps you put the tights on and off without removing shoes. Corded Drawstring plus soft brushed elastic help to adjust fit at waist so the garments stays in place. Fabric: polyester with a DWR (Durable Water Resistance) surface. This face fabric is treated with DWR in the manufacturing stage and then laminated to a waterproof, breathable membrane and a liner fabric that is a hydrophobic polyester knitted stretch fleece. I am 6'5" 215lb and bought a Tall XL. I use these for running. Great length, warm and good quality. My only complain is that there are no pockets. Please redesign and install at least one pocket preferably with a zipper, so I can at least carry a key and id. These are amazing; cut generously for large individuals, and certainly long enough. 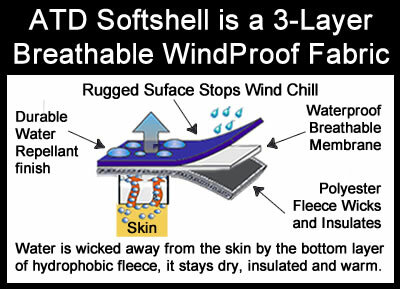 The thermal capabilities and wind resistance are outstanding. Got these for winter riding in Illinois. I ride down to about 25 degrees and never feel the wind or cold in these pants. Terrific product. Exactly what is needed. I commute ~30 miles daily on a recumbent, so wind protection on just the front isn't always adequate. These tights provided full protection and are my go-to tights for the coldest rides. Sturdy, well made, and good fit! I am a big fella, at 6 foot, 250 lbs, and these are great pants. I purchased the 4 XL, per the instructions of the post, and they fit perfectly. They are warm (can't really wear them above 45 F, but they work in Minnesota winters) and comfortable. If they are still available after this pair wears out, I will be purchasing them again. The only thing I am left wanting for, and this is nitpicking, is something to hang them by. There is not a tag or coat rack loop, and they slide off of the rack when hung by the waste-band. I was really excited to get these pants since they were rated for - 5Ã¸ to - 30Ã¸ but I wore them in 17Ã¸ weather and I froze. I was doing a light ride so nothing where I was going above zone two and I had my bibs underneath that are good until about 30Ã¸. I think it may need a light layer if a wind blocker on the outside and they would be good. My glutes were the coldest I loved the pants design though and was sad it didn't work. My husband is now using them for cyclocross in warmer temperatures. It does run a size small, so order one larger then normal, but it's well constructed, and will last a long time. Amazing pants, and made in the USA by a company with a bunch of great people. I bought a pair of these pants 5 or 6 years ago. I have worn them every winter since purchasing them. I only recently broke one of the zippers. I called the company and they said send them and they will replace the zipper FREE OF CHARGE. I live in Michigan and have worn them down to below zero and they keep me plenty warm. I primarily purchased these for winter commuting (upper teens to mid 30s). They work wonderfully. Completely protect from wind and are nicely warm, at least at mid-20s. Zippered ankle fits perfectly over winter riding boots. Rode home when it was mid 40s. Still comfortable, but would probably be too heavy for much higher temperatures or for hard riding. Seem very well constructed. It is mentioned elsewhere the sizing is on the small size, which I agree with. I am 5' 10", 150lbs and the large fit very well. Highly recommended. I would give these 5 stars because they are are excellent, but they have one thing that holds them back. I have worn them in the teens without any issues. They fit great over whatever tights, bib shorts or knickers I choose to wear. They provide adequate wind protection. I have not had the chance to see how they do in the rain yet, but I was nice and toasty in the snow. The one thing that knocks them down to 4 stars is they make me slide on my saddle. I ride a Brooks Professional leather saddle. Even with the nose tilted slightly up I found myself sliding forward with these on. In order to prevent this I have to ride with the saddle cover on. All these need to be 5 stars is some sort of non-slip material in the seat. Make sure you pay attention to the size chart. I went big on these and I'm glad I did. I wear the 2XL Bib Shorts so I went with the 5XL size of these. They fit perfect, not too big or long and not too small or tight. When I first ordered I focused on the inseam, forgot about pedal and crank conflicts. So I ordered the next smaller size (XL for a 34 inch waist) and they fit and performed great. Rode on a 42 degree overcast day and remained comfortable the entire 3 hour ride. Did not overheat during hillclimbing. Great product, plenty of thought was put into knee construction of the garment. Recommend you give these a try. Great product for cold weather bike riding. I use these tights when the temp is below 40 and they keep me comfortable, not to cold or to warm. Not truly tights unless you buy them small, I like a looser fit. I may expand my lower temperature of bike riding from the current wind chill of 30 degrees down to 25 degrees now that I have these tights. 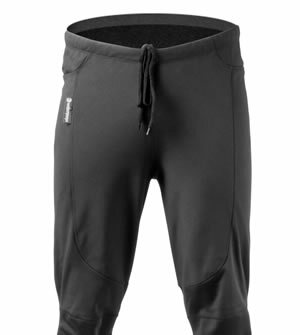 The Best Cold Weather Biking Pants I have ever Worn! These pants are tight where they need to be tight and loose where they need to be loose. We had a cold windy November day and these pants and rode a hilly trail with no warmth issues at all. I liked them so much my wife bought a pair for herself. She is now a fan as well. they are warm (even for Wisconsin cold weather! ), comfortable, and stretchy. The only (small) complaint is that the waist seems a little low for a 6'3" guy. second purchase from aero tech. haven't tried them for the cold yet, (still summer) but tried them on and they are plush. have had no success with sizing of other winter tights/bibs. these are right on. not likely to use them on road rides as they are just a bit loose in places, but will work very well for the mountain bike. Great performance worth every penny! Love these pants. Rode the "Old man winter" ride in Lyons, CO in these...was very happy to have them. 33 degrees windy muddy sloppy day...it was a great time as these kept me warm and dry! Thought I wouldn't be able to keep cycling during the winter due to the temperature. One ride with these pants and I knew my winter riding blues were gone! Order came quickly. Very comfortable when riding. 1st ride I wore padded shorts and tights underneath and was too warm (30 degrees). 2nd time, rode in 20 -30 degree weather with just a pair of padded shorts underneath and stayed warm throughout a 17(+) mile ride. Blocks wind well. I'm 6'1, 195lb and bought an XL. Fits very well. Great product--use the size chart! Great for 30-50F. I've ridden with and without base layer. There's no problem with wind. I have a long trunk and short legs. Bib tights don't fit so I use tall bib shorts and were these over the padded shorts. I'm a 38-38 waist and ordered 3xl which fit just fine. Use the size chart. Great pants for winter road riding! Made for long, warm rides. Sizing runs a bit small. These are wonderful pants (tights). They're extremely well made, warm, and nice-looking. They're slightly loose-fitting, as I wanted, but they're not floppy about the ankles so they stay clear of the chainwheel. I'm a 34 W, 5' 10", 154 lbs, and I usually buy a large size or even a medium, but the XL size fits perfectly, as their sizing chart said it would. Customer service is excellent, and a live (knowledgeable) person always answers the phone. However, all this is almost beside the point, because if you want biking pants that actually provide warmth on cold days, not just a rain shell to go over work clothes, there's nothing else out there (except possibly one other model from the same company). Like another reviewer, I had looked high and low for just this kind of thing, and found nothing in the same league. I only wish there were a zippered back pocket, but this is not nearly enough to derail a five-star rating. I've been looking for over a year for pants like this. Have only worn them once as I bought them in early spring. I commute year-round about 30 minutes 1-way. Only reason not to commute is snow or ice. These are warmer than the ones I am replacing that were good down to ~10 degrees. I ordered the next size up, but they were too large. Sent them back for my normal size which fits like expected. Exellent communication and customer service. Considering a 2nd pair while on sale.